It was a bit of a rocky start this year as despite my specifically asking my travel agent about visa’s for Taiwan I couldn’t get in to the country as my passport expires in five months (not the mandatory six). End result, no Kung Fu training and I had to transit on to Okinawa early and without Hannah, who was in Taiwan with Paul and Anne for a couple of days. We were supposed to be training with shifu Liu Chang I in the Feeding Cane system of boxing; a close relative of our own Goju Ryu system. I am researching the origins of the different kata and drills to further my own raining and this trip was supposed to be an exciting stepping stone. Sadly it was not to be. The end result; out of pocket for the ticket changes and now two lots of accommodation in two different countries, plus training plans in disarray. Our good friends in Okinawa at the Tsuboya Garden House Hotel were able to get me a room despite it being new years and them being near capacity. Satoshi Kinjo sensei sorted things pretty quickly and before I knew it I was joined by Kyle and we were at the Kubagawa dojo training, then after training drinks for their end of year party, then more shenanigans at Taira sensei’s until the wee hours. The Uechi Ryu & Kobudo folks from Satoshi sensei’s Kubogawa dojo are very hospitable and there was a lot of interaction despite the language barrier. We presented our “omeage” (literally “souvenir”, traditionally food from home country) which this time around was honeycomb from a local bee keeper. Honey and bee keeping is still new in Okinawa as they were only introduced relatively recently so we had a bit of explaining to do. Once they tasted it they were sold though. We also presented Satoshi Sensei with an Aboriginal fighting shield we had made by Aboriginal artist Patrick Ferguson of the Pitjantjatjara. It was hand carved from a single piece of mulga. Before we knew it we were picking up Hannah, Paul and Anne at the airport and off to training with Taira sensei. Suffice to say it was another late night. For New Year’s Eve we went for a walk around Naha taking in the sights, including the beautiful Fukushuen Gardens at night. That was a first. Karate demos, Ryukyuan dance demo’s and sake and local beer………. Good start to NYE. We went on to Nominoue Shrine early to beat the NYE crowds and ate from the market stalls, had a few goes on the dodgy side show air rifles and won toys that Hannah terrified the local kids with by chasing them to give them away. Pretty funny. Believe it or not, we were in bed by 10. New years day we once again strapped on the walking shoes and wen to Shuri Castle early to check out the ‘Royal’ New Years ceremony, as well as th Ryukyuan dancing etc. It was quite a spectacle. Okinawans celebrate New Years on the evening of New Years day so we wound up back at Taira sensei’s house with his family and long standing local students for the New Years celebrations. Monday morning the rest of the crew arrived with Mark and Phil from the Sunshine Coast and Ron and Jo another Gold Coast Dojo. From there on in it was training in Kodudo with Satoshi sensei and sometimes his brother Kenta, and then Karate training in the evenings. Big days! There was one notable exception which was the Kubogawa Dojo shinenkai (New Year’s party) on the Tuesday night instead of training. Wow what a night! 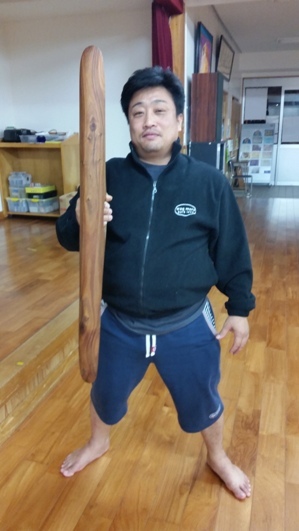 Ron and Jo bought Satoshi sensei’s wife Nanae a beautiful gift of some Aboriginal art, of which she’s a big fan. Below is a pic of the painting. The story of the painting is that the four large circles represent mind, body, spirit, and emotion to create a whole; this is tied in with the Asian 5 element theory and Musashi’s “book of five rings”. If you look closely you will see earth, wind, fire and water, with the middle circle being the void. The blue is for the salt water, the yellow for the beaches and green is the land/mountains around the Gold Coast. When she received it she jumped up and down clapping about 200 times. Funnily enough I’ve had several graphic designers try and tie the Gold Coast together in an image for a t-shirt for this year’s camp. Hey have all failed miserably yet this painting does it perfectly. 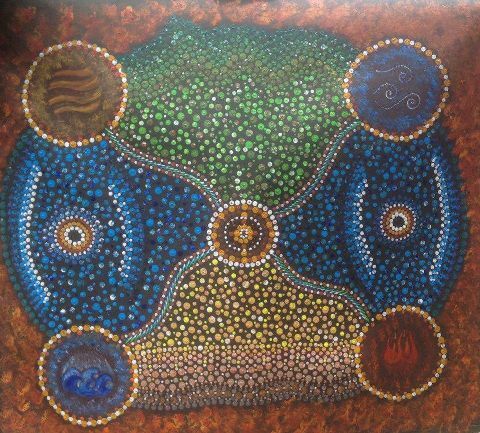 The story of the painting is that the four large circles represent mind body spirit emotion to create a whole, the blue is for the salt water and the other two sections will be the land/mountains around the Gold Coast. Mostly we trained…… we walked, trained, tried to sleep then trained again. Our last training session was on Saturday afternoon. In the morning we went on a tour with Miguel Da Luz of the Okinawa Karate Kobudo Liaison Board. He took us to the graves of significant masters in Okinawan Karate and explained their importance, as well as to Tetsuhiro Hokama’s karate museum. Afterwards we went for another long walk through Nominoue Shrine, Fukushuen Gardens and other sites we could get to on foot. Then we trained. And Taira sensei and his wife threw us a ‘Sayonara Party’. Hannah and I got home at nearly 4am. Sunday was a little free time and shopping before going to a Korean BBQ restaurant with Satoshi sensei before heading to the Dojo Bar. For most of us it was an early night as we were all exhausted. Monday we packed up and checked out but as our flight did not leave until 8:55pm we had a full day of souvenir shopping, catching up with friends and chilling before heading off home a tired but accomplished bunch of travellers. We’re already planning 2018’s study tour. Stay tuned. What does the Australian Government have to do with martial arts?